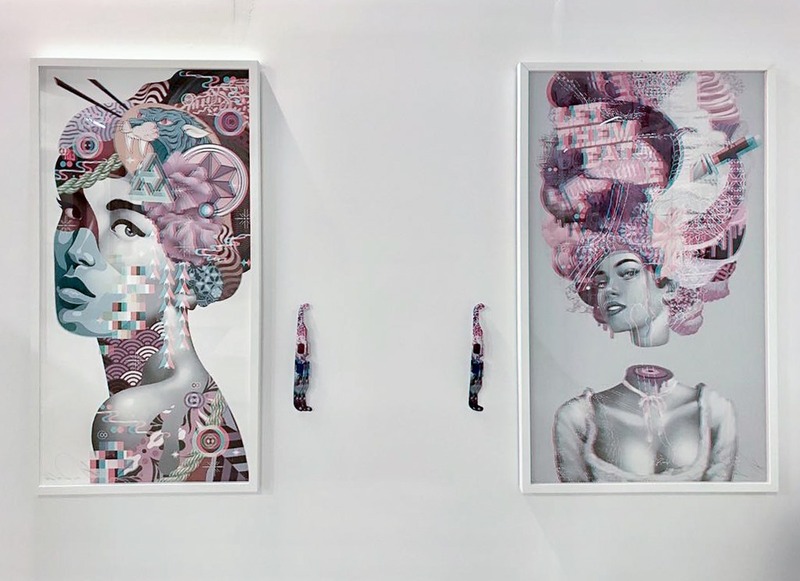 Tristan Eaton will release two editions to liven up your wall on Wednesday (3.13) at 12 PM PDT from his online store : Kiss My Assassin poster (Open Edition, 24 x 36", $50) and AP editions of his Go Together print (10 APs, 18 x 26", $400). Both are excellent ways to add Eaton's art to your space for creating, dreaming and living. Need more? Check out artist's excellent Paintings volume from CASS Contemporary which features the Kiss My Assassin image on the cover. Chris Ryniak has released a brand-new adorable print -- ‘Look What I CaughtLook What I Caught’. 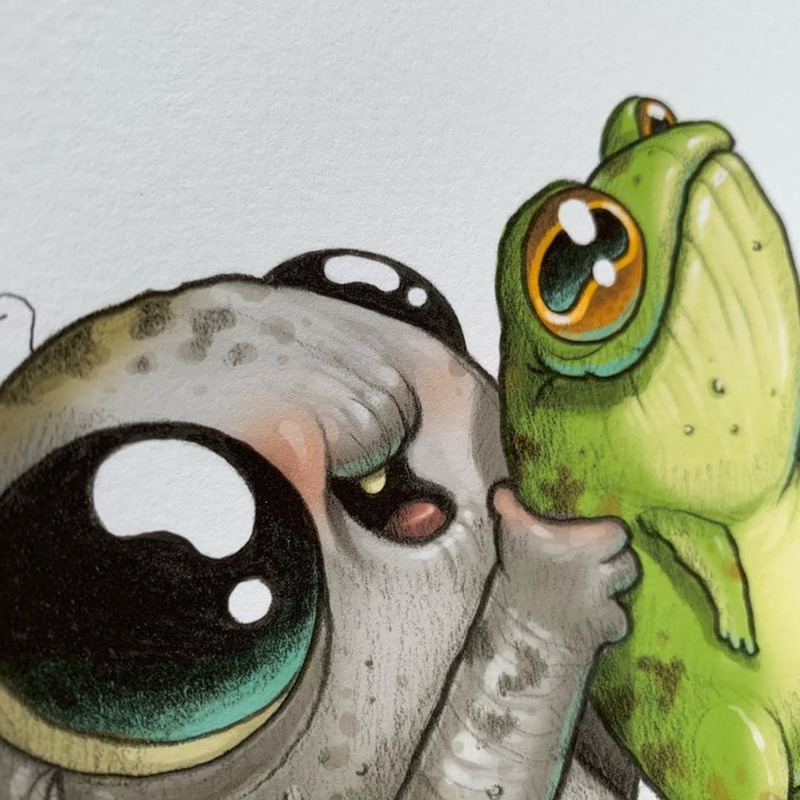 The 5x7” signed giclee print has us thinking ‘Can I keep him? Please…’. Available now for just $15 from Bindlewood. Heads up! 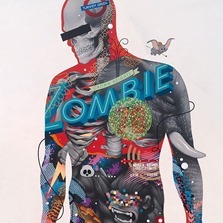 Tristan Eaton will release a giclee print of The Son—a self portrait—as a timed edition. At 20” x 40” which is slightly less than half the size of the larger-than-life original (48” x 96”) from his Legacy 2015 solo in LA, the print will offer a strong representation of the painting’s tremendous detail. In order to meet the demand of his mushrooming collector base, Tristan will release The Son as a 48-hour time release edition from 12 PM on Friday (9.21) through 12 PM PDT on Sunday (9.23) for $200 via his online store. 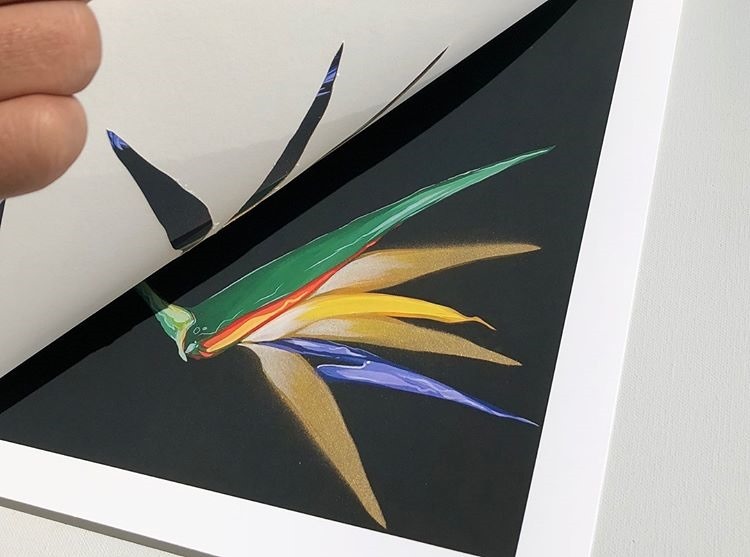 The final edition size of this not-to-be-missed, embossed, signed and numbered print will be determined by orders placed within the sale period. 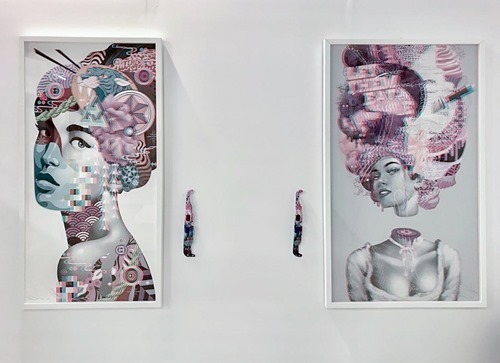 If you haven’t done so already, this would be a great time to pick up the beautiful Tristan Eaton: Paintings book ($75) from CASS Contemporary. The oversized-format volume (17” x 11”) is an excellent presentation of his paintings and does justice to the work—no trivial feat. 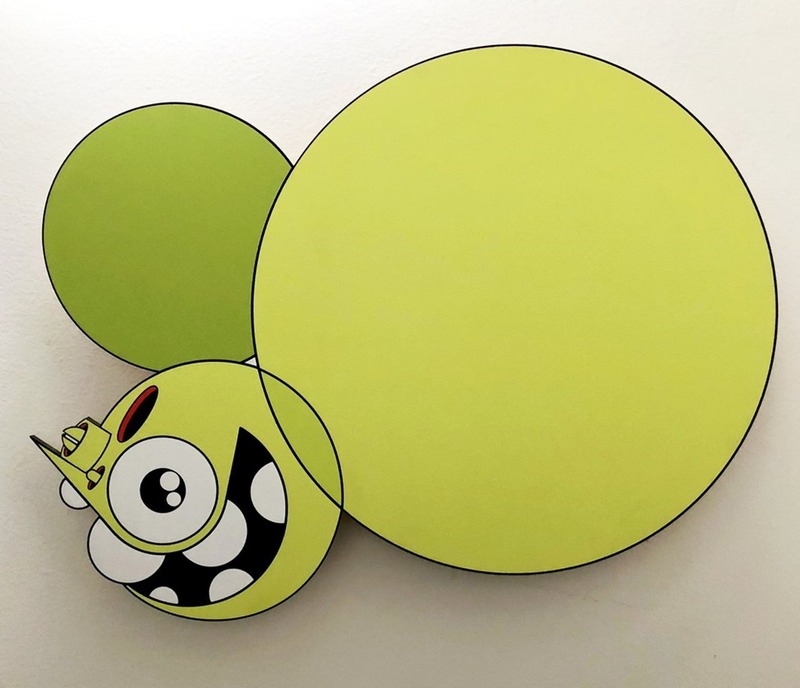 Thinkspace has just released their new Space Monkey (Green) wood print from Dalek. Limited to 25 s/n pieces and measuring 18 x 18”, this one features a 6-color screen print on birch plywood which is then laser cut to shape to create stunning wall art. 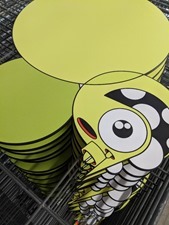 The cut shape aspect gives these prints more of an original feel compared to that of a standard rectangular print. 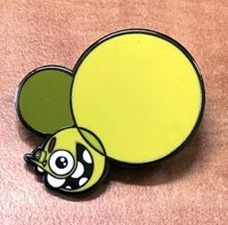 These are available now over at Thinkspace for $160 (+ s/h) and include a bonus matching Space Monkey enamel pin. 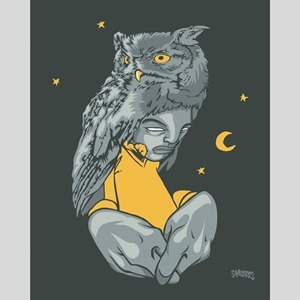 Woes and Silent Stage have a dope new print dropping this morning (4.18). 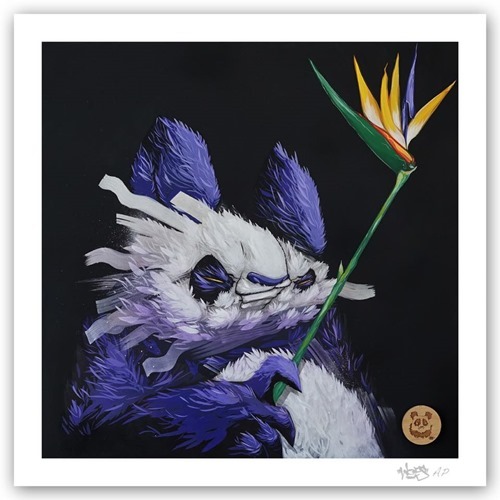 Woes in Paradise features a purple panda chillin’ with a bird of paradise. This one will be available in both a standard (100 s/n pcs, 17x17”, $74.99) and a deluxe hand-embellished edition (10 s/n pcs, 24x24”, $299.99). 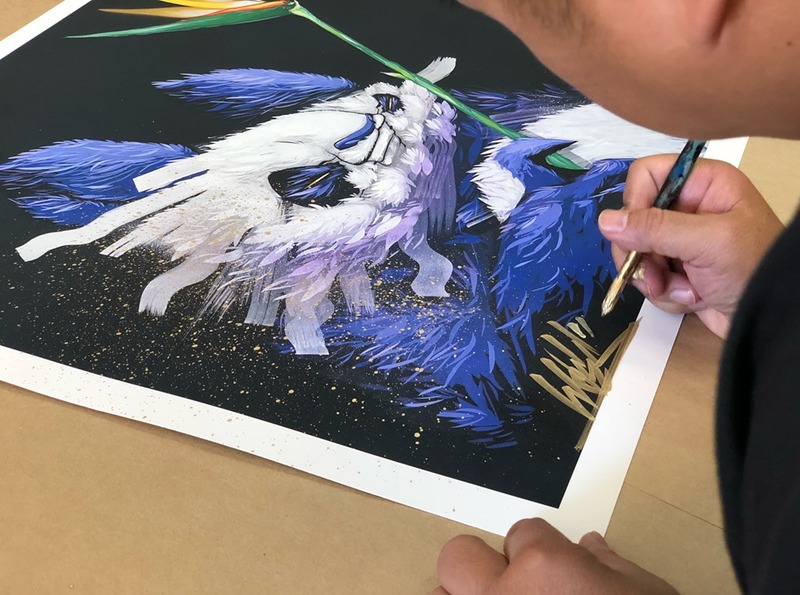 The hand-embellished large-format edition features gold splatter, gold stenciling on the flower, and is signed big and bold in gold as well. These drop on Wednesday (4.18) at 11 AM PDT from Silent Stage. 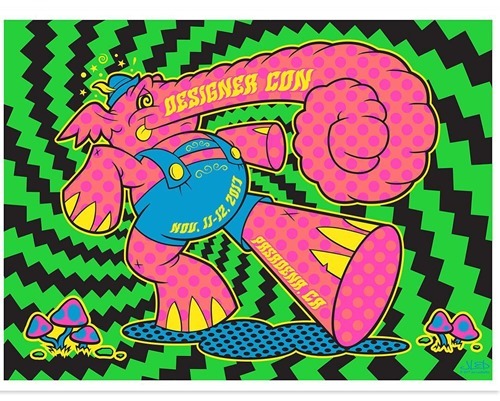 With DesignerCon less than a month away, news of official ‘con exclusives and releases is flowing. Today, JLed revealed his trippy DCon Serigraph print featuring a pink elephant who you might recognize from his sublime Outsiders series. The 18x24” backlight-ready print features black flocking for that pyschadelic 60’s vibe. It’ll be available at the official DCon booth (#124). 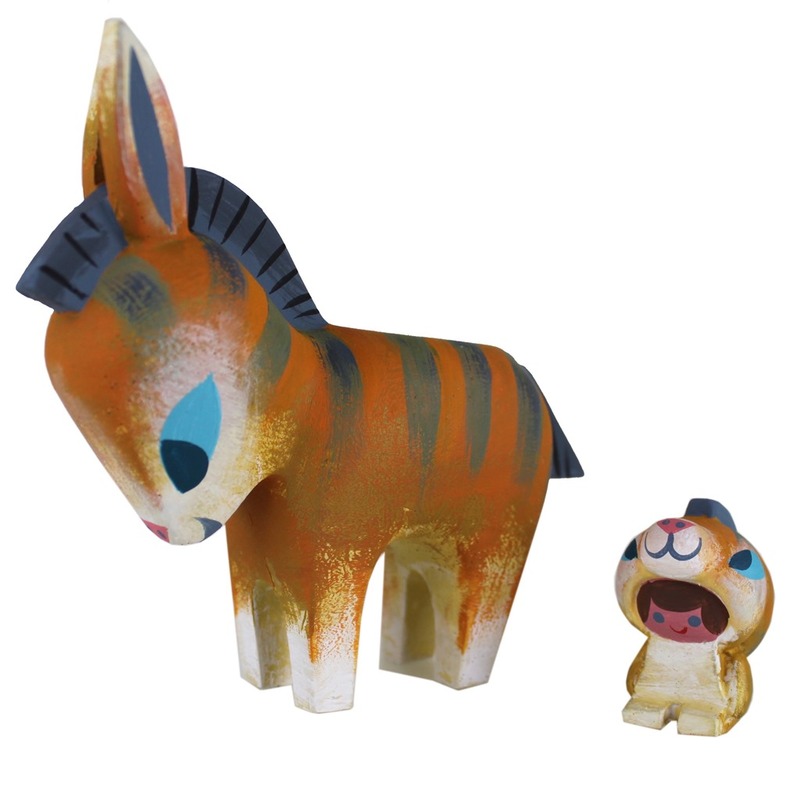 The print announcement follows news of the DCon Exclusive GID 3” Dunny by Juan Muniz, available only at the DCon after party. Grow your army of Huck Gee Gold Life prints with this week’s latest release! 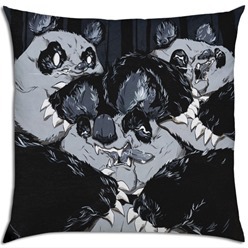 This run features some new recruits, such as Peng Peng and Ornery Panda. You've also got the veteran Golden Claw joining the print ranks. Each numbered and signed print measures 7" x 7" and are limited to 60 pieces. You can find them in the Huck Gee store HERE for $20 a piece. Be sure to pick a few up to go with your Gold Life figures from Mighty Jaxx. 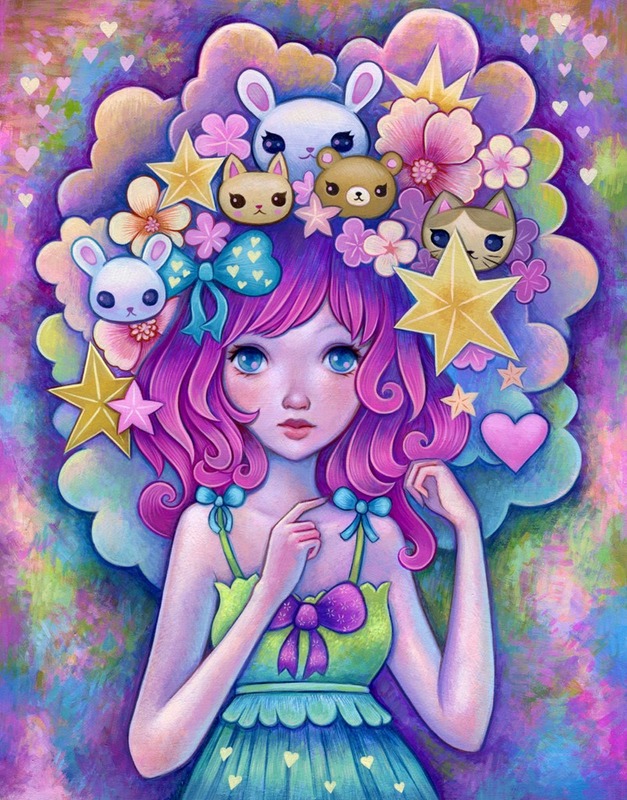 Jeremiah Ketner has just released three new prints – Spring Flowers (11x14”, $30), Favorite Things (11x14”, $30), and Let’s Hang Out (8x10”, $20). While those prices are rather reasonable, you can get 25% off any of his prints during his Spring Print Sale by using the “SPRINGSALE” checkout code. 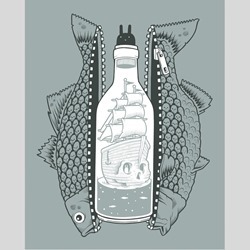 Be sure to check out his numerous prints, as well as a selection of original part, postcards and more. Jeremiah is also on Patreon with several reward levels including $1/month which gets you a behinds-the-scenes look including work-in-progress, sketchbook peeks and more. 10% off store purchases and more. This is a great, easy way to help support him as a full-time indie artist. If you just received your Gold Life figures by Huck Gee and Mighty Jaxx, you may want to compliment them with these awesome prints by Huck. Limited to only 50 pieces each, the new Raku Night, Raku Day and Soul Collector prints can be found on Huck’s website HERE for $20 each. 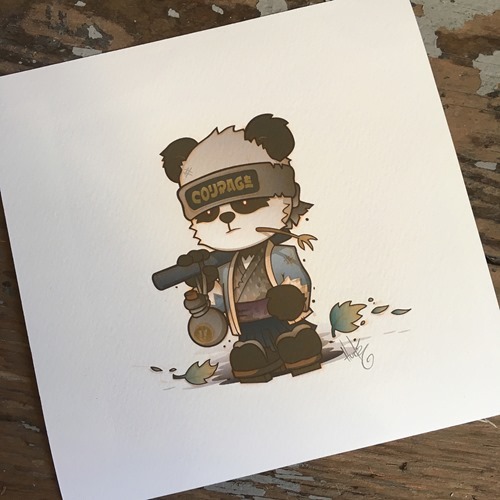 They all come signed and numbered by Huck and measures 7” x 7” on archival quality watercolor paper. Upper Playground has just released some new prints from a couple of their favorite artists! 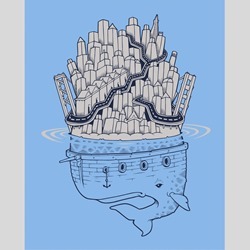 Jeremy Fish happily brings to you “Whales Island” and “Bottled Up”. 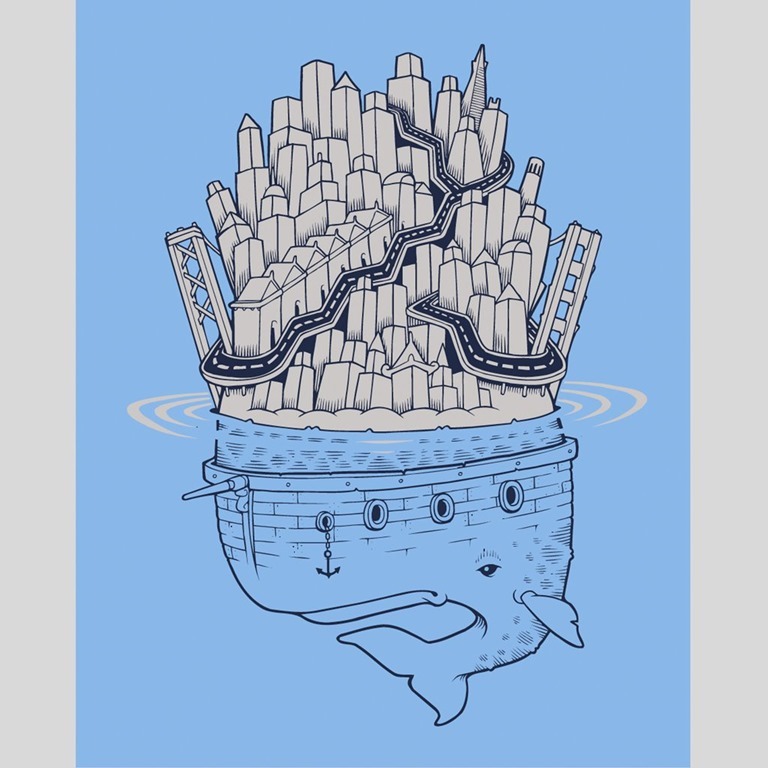 Both prints feature Jeremy’s signature style, as well as his love for the Bay Area with the “Whales Island” print. Coming from the mind of Sam Flores is “Night Owl”, which features Sam’s classic style. Each of the prints measure 8 x 10” for $35 and come framed! What a deal! Find them available now through Upper Playground HERE. Michelle Valigura and Amanda Visell (along with interns) have been quite busy. They’ve just dropped two fancy horse-ish resin sets. 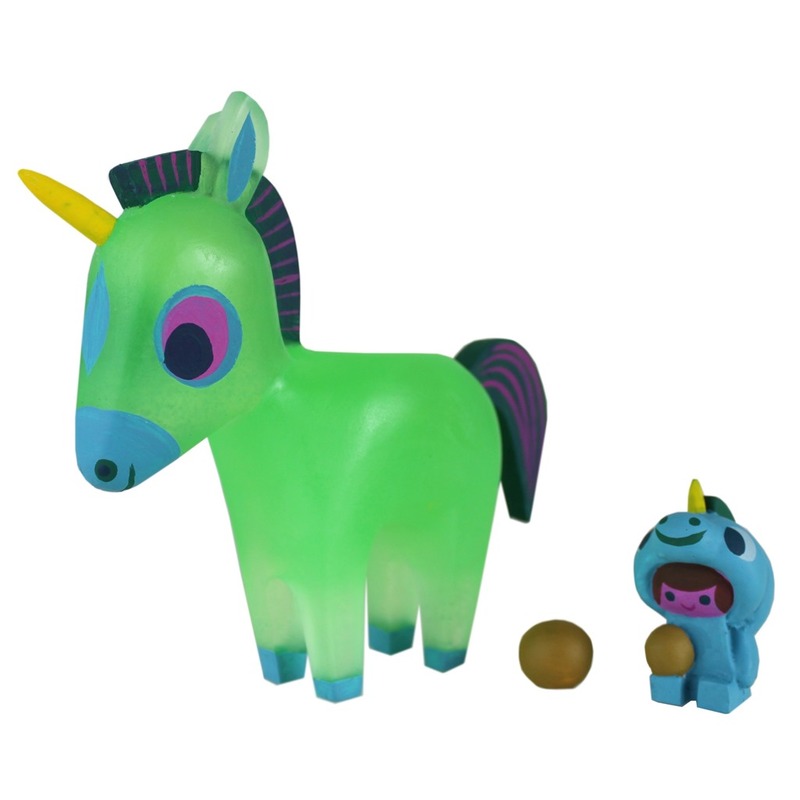 First up there’s Lucky Poopicorn which is cast in neon clear green and comes with a mini poopster plus yes, a ball of poop (25 pcs, $90 + s/h). Continuing the magical trip, there’s also Tiger Zebra (25 pcs, $90 + s/h) which is the latest version of Burro y Burrito. Both of the horsies are available now from Switcheroo. Plus, Amanda recently released her Dream. Live. 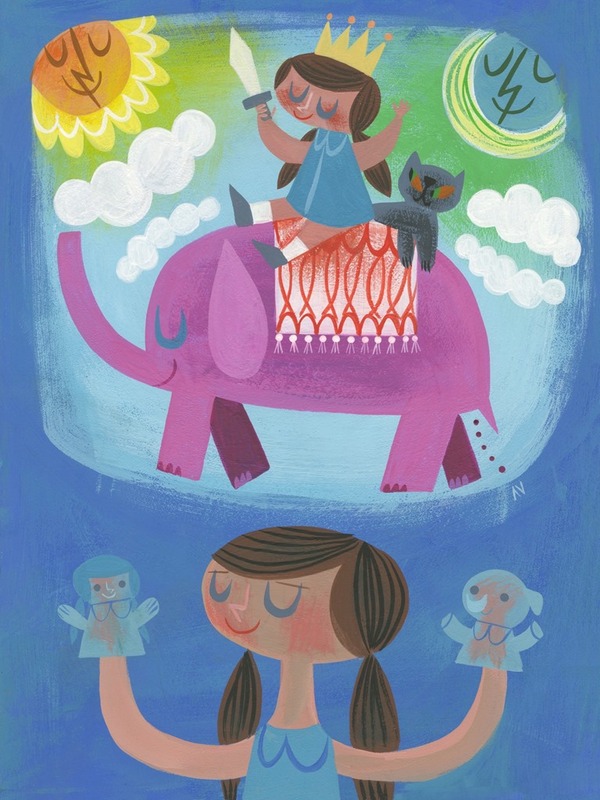 print (11x14”, $25 + s/h) for Heartworks with the net proceeds going to help children by providing art supplies to the Target House at St. Jude’s Hospital. 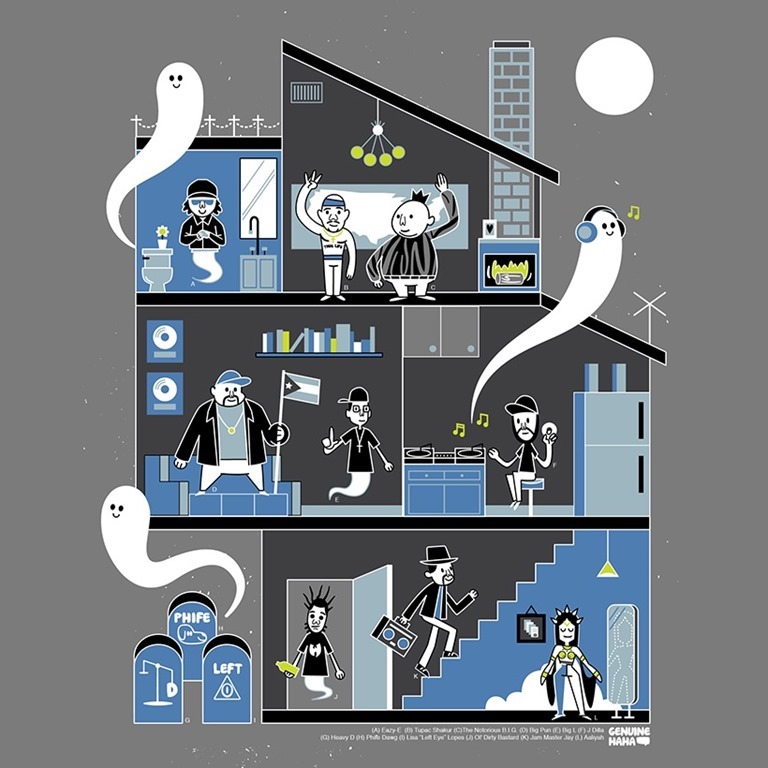 Tony Bui has recently put out a print for all you Halloween and Hip Hop fanatics! 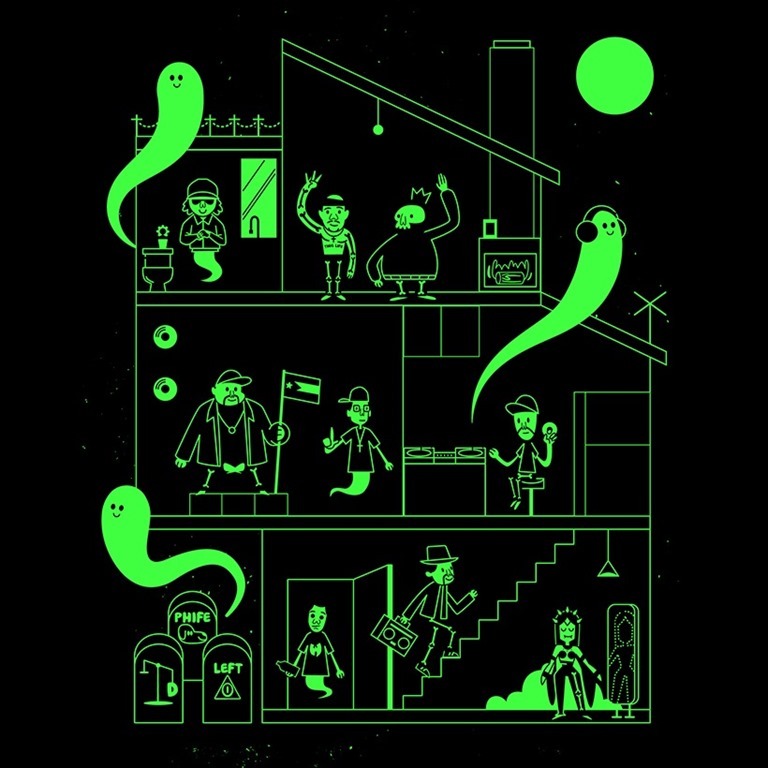 A little bit of both worlds collide with Tony’s Hip Hop Haunted House Print, which features some of the legendary Hip Hop artists who are unfortunately not with us anymore. We could list everyone on the print, but we think it would be fun for you to guess! 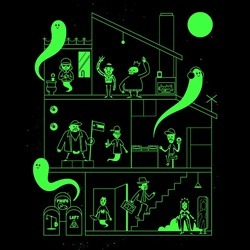 This print measures 11” x 14” and also features some bonus Glow in the Dark action. You can find them available now HERE for $20 a piece. 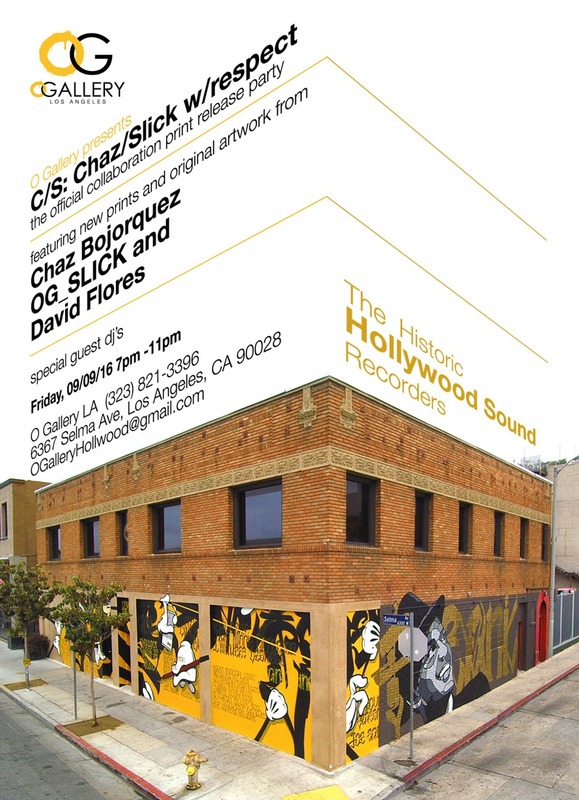 Join Chaz Bojorquez, OG Slick and David Flores at the historic Hollywood Sound Recorders studio building (now O Studio) for the official release party for the C/S: Chaz/Slick with Respect print release—based on the mural project (1xRun Interview) on two-facing corners of the legendary site—on Friday (9.9) at 7 PM. The first 20 C/S print sets featuring all three of the 1xRun screen prints (editions of 150) will be available at the event. 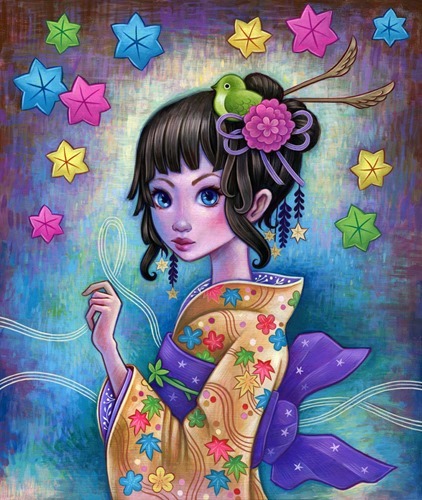 The event will also feature select original works from each artist. Completed awhile back, the Hollywood Sound Recorders project also includes David Flores’ mural portrait of Frank Sinatra—one of several greats who laid down tracks at the studio—with a stylish signature script assist from Mr. Bojorquez. To celebrate the mural, 1xRun is releasing the Hollywood Sound print series in staggered fashion with both C/S 1 (150 pcs, $150) and David Flores x Chaz Bojorquez Frank (100 pcs, $150) prints currently available. 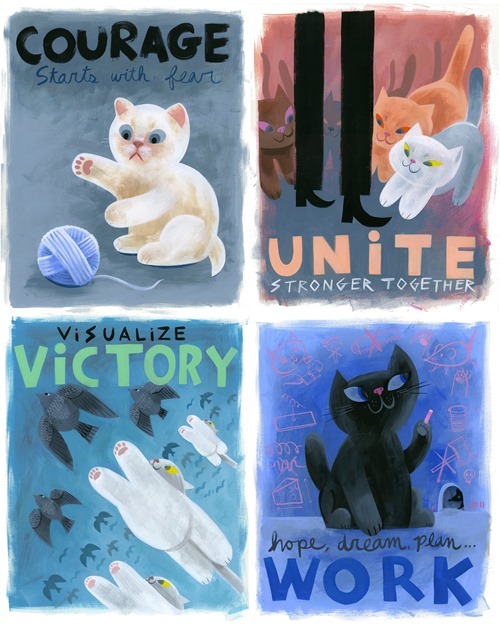 If there was one person we would like to see create inspirational posters created in the style of propaganda posters with CATS, that would be Amanda Visell. Available now are 4 different poster designs that are meant to motivate and move you! Each poster measures 16 x 20 and are printed on archival poster paper for only $30. You can find Courage, Victory, Unite and Work HERE. 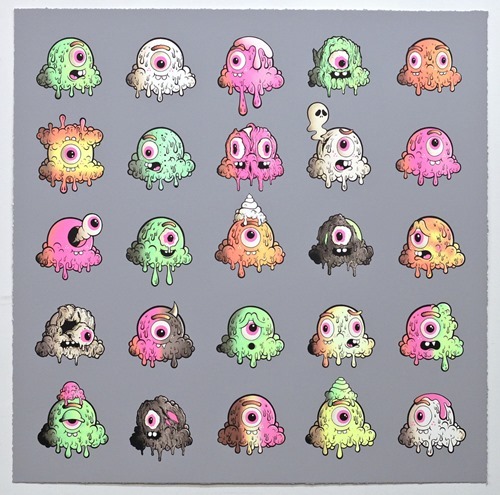 PK Shop has released a brand-new six color screen print from Buff Monster. Motley Melties features a giant helping (30” x 30”) of the pink one’s ice cream heads – each different in shade, flavor, and mood. 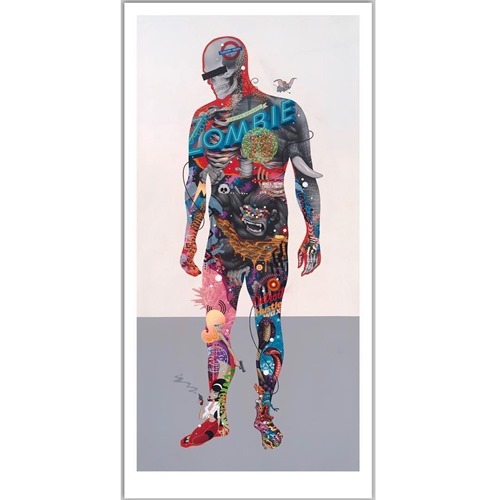 An edition of the 60, the print is available for $500 directly from PK Shop. Recently coloring books have become extremely hot—a creative and reflective out for grownups caught up in the fast lane. 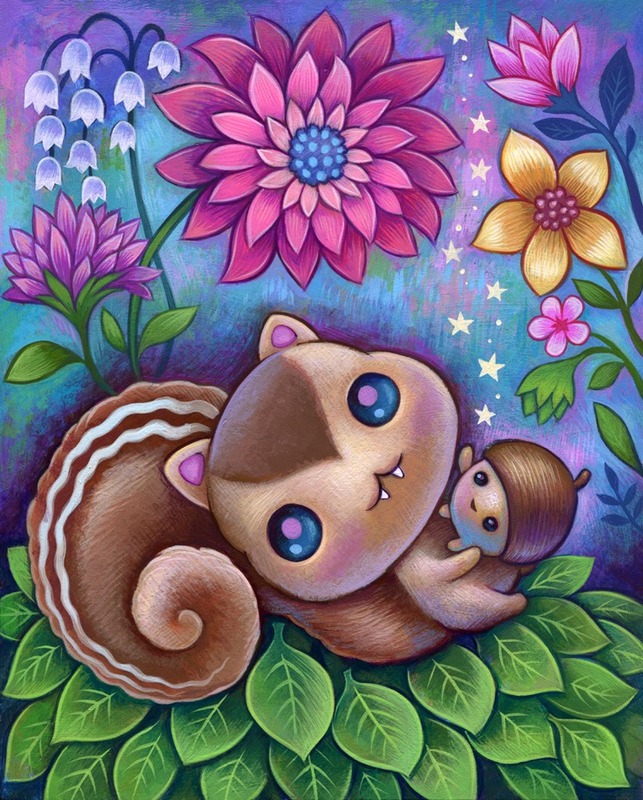 Offering a twist on the coloring craze, Rotofugi has released its first set of artist coloring cards featuring Jeremiah Ketner’s graceful art. The set includes five images printed on 14 point uncoated 5” x 7” uncoated card stock, ideal for colored pencils and/or markers. 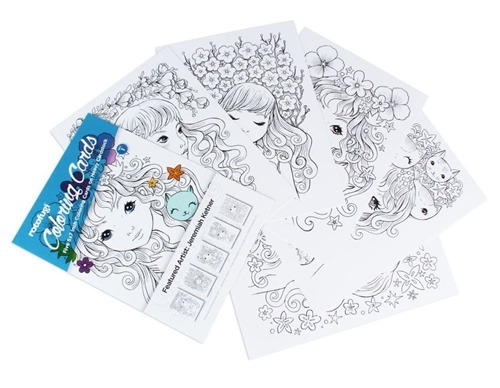 The Jeremiah Ketner Coloring Cards are available now for $4.95 (+ s/h) per set from Rotofugi. This is just the beginning of the coloring adventure,Rotofugi plans to offer Coloring Card sets from additional artists in the future. 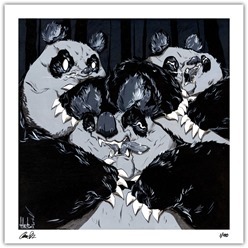 1xRun will release a hand-embellished print edition of Marka27’s Nocturnal Wisdom (50 pcs, 16x20”, $65) on Tuesday, November 10th @ 9 AM PST. 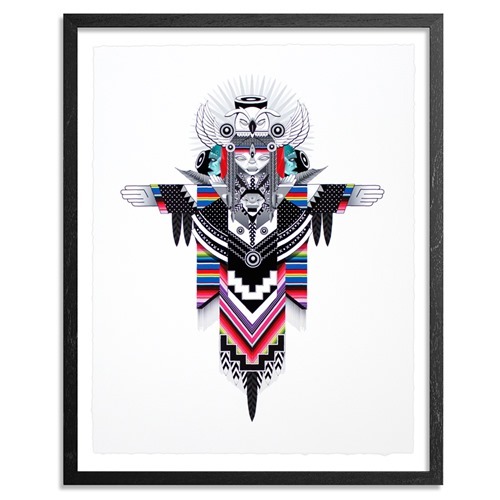 Shown above with the optional black frame, the piece is anchored by the owl—‘the cousin of death—and nicely captures the existential dichotomy with black+white sections mixed with color ones. As with most of his work, Nocturnal Wisdom blends indigenous culture—most notably here with the traditional mexican Serape blanket—with the contemporary as seen in his recurring use of audio speaker imagery. In addition to the new print edition, 1xRun will offer a selection of originals from the artist as well. Marka27 will be making the trip from Boston for NYCC. 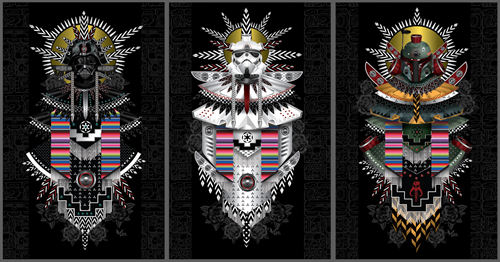 He’s created a series of new ‘Estrella Wars’ prints for the occassion. 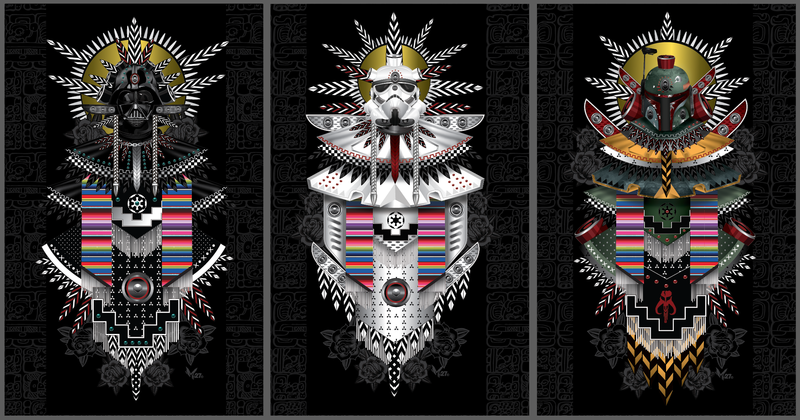 By blending his Minigods music-speaker aesthetic with the serape—traditional multi-colored Mexican blanket—Marka offers his unique indigenous take on a trio of iconic Star Wars villains: Fett, Stormtrooper and of course Vader. 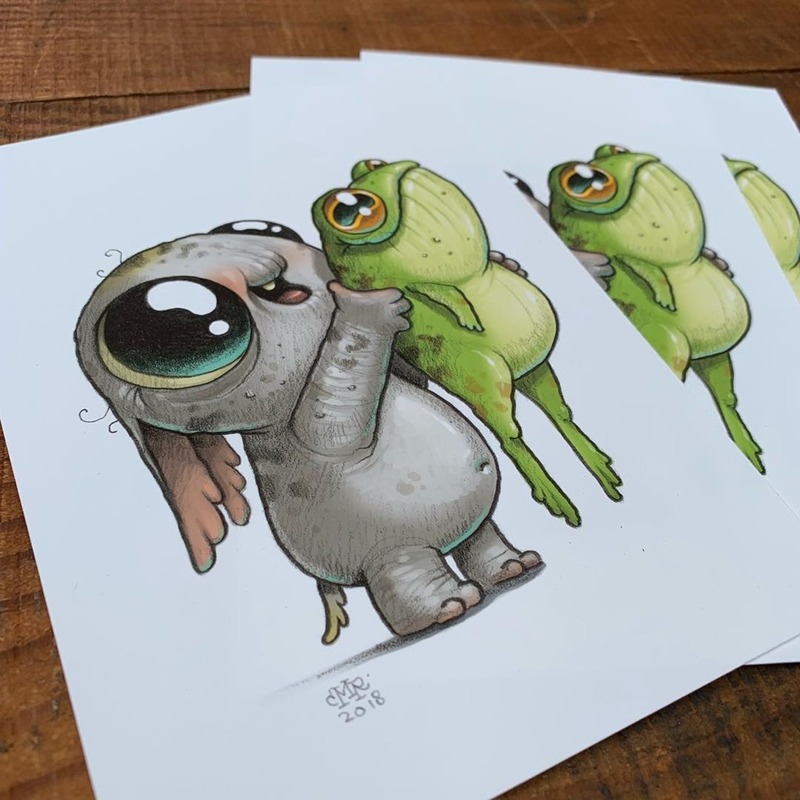 The prints will be available individually (8x10 and 20x13 sizes) or in sets of three from the Art Whino Booth [#104-108] beginning on Thursday (10.9). Just back from 3A’s Japan Venture, Amanda Visell is launching a quick follow-up to the original edition Bramble + Kitty resin sets which sold out at the show. 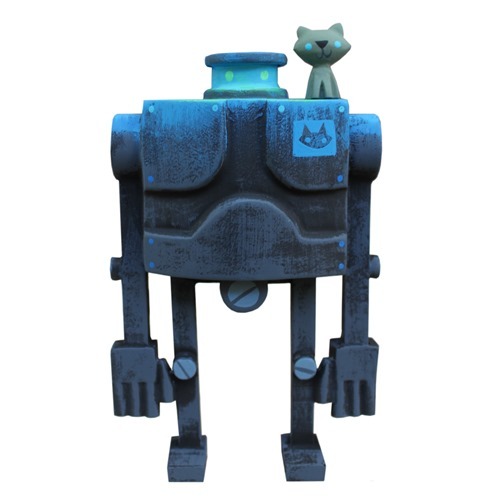 Amanda’s popular color treatment works well on the new Moonglow Bramble + Kitty with the soft blues set against Bramble’s blue-gray steel. For the release Amanda’s trying something new – Moonglow Bramble will be available as a 24 hour timed-release beginning on Thursday (10.1) @ 8 AM PDT for $160 (+ s/h) from Switcheroo. So if you want one, get your order in within the 24-hour window and you’ll be set. Sticking with the WWR theme, Amanda will also be releasing a giclee print of her original painting done for Venture. 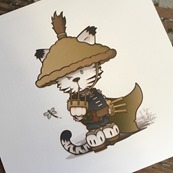 Limited to 50 signed and numbered pieces, World War Snuggle (17 x 21” with a 15 x 18.75 image) will be released at the same time as the Bramble resin. Please note that both of the items will not be visible on the store until tomorrow’s release. 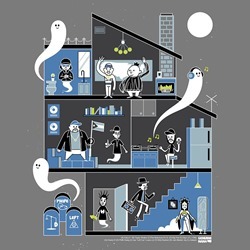 Just in the Huck Gee shop is a brand new set of prints! 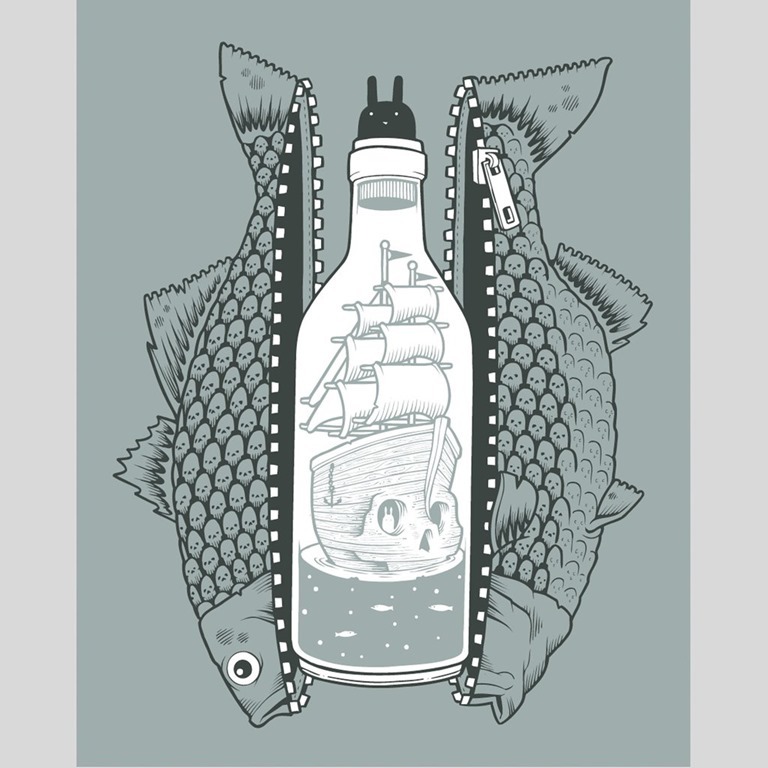 DAME Dreams features 3 individual prints that show the exploration of tragedy, recovery and triumph of the Diesel Armored Mobile Emplacement aka DAME. Each is printed on art watercolor paper and measure 10” x 10” (8” x 8” with 1” border). 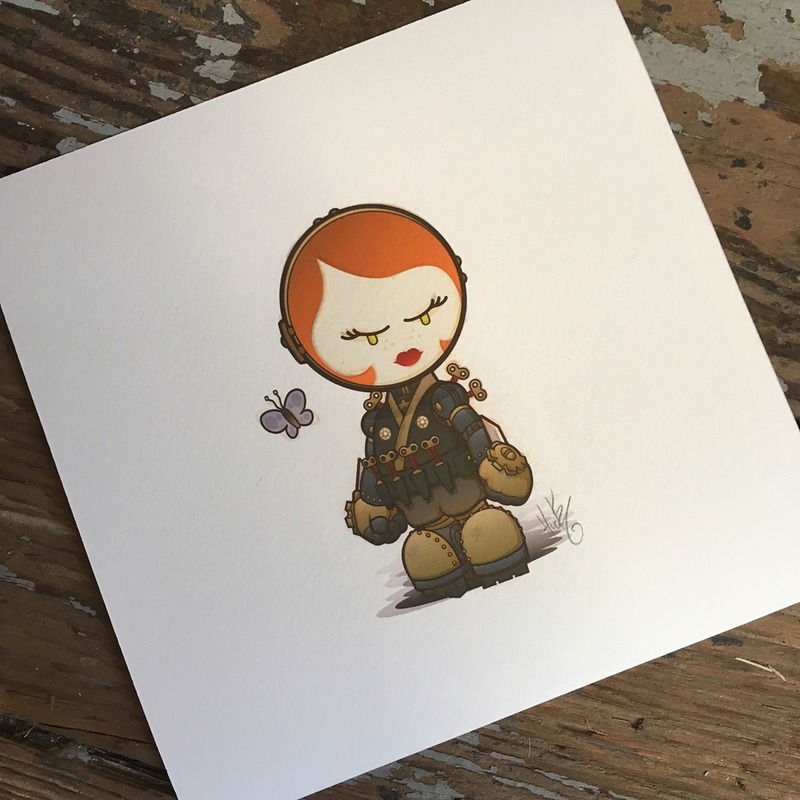 They are limited to 100 pieces each and come signed and numbered by none other than Huck. You can find them available HERE for $39 each with free domestic shipping. Buff Monster has collaborated with Prints on Wood on his new Strawberry Terry cut to shape prints. Strawberry Terry will be available in two editions – the stand-alone edition ($100) and a framed edition ($150) featuring the shaped print mounted into the frame for a fancy multidimensional effect. Both prints will be available in a timed release window beginning on Wednesday (8.19) at 10 AM PDT and running through Friday (8.21) at 11:59 PM PDT via Prints On Wood. 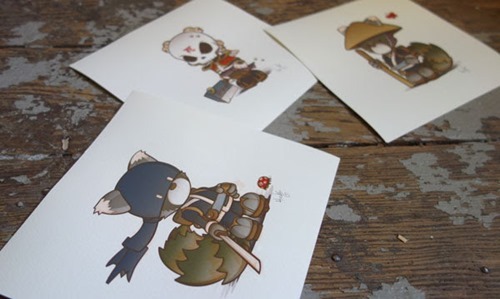 Silent Stage is releasing the Monkey on my Back giclee print set from Luke Chueh on Monday, August 17th @ Noon PDT from their web shop for $135 each or $250 for the set of two. Both Monkey on my Back (Rude Awakening) and Monkey on my Back (Sleeping Burden) are limited to 35 signed/numbered pieces and measure 20x24”. Get Ready. Jermaine Rogers will offer up an epic release on Friday (8.14) @ Noon PDT over at JermaineRogers.com featuring a treasure trove of art toys, prints and more. First up are three new Mini Prints in several editions—Always Remember Son, We Carry Each Other and Frida & Vincent. 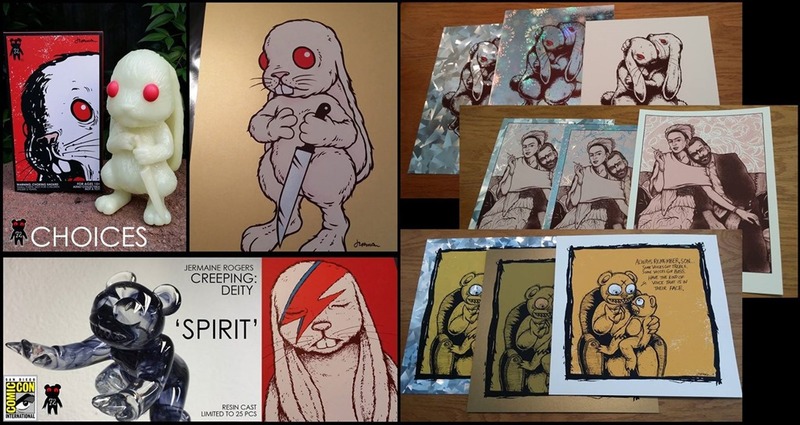 Next, if you missed SDCC, Jermaine will also be offering the remaining quantities of his comic-con drops including the Choices GID vinyl (75 pieces, $80), Dero: Creeping (Deity Series) Spirit resin, Aleppin Sane SDCC Scarlet Variant Print (30 pcs, $60) and Choices SDCC Gold Dust Variant Print (20 pcs, $60).